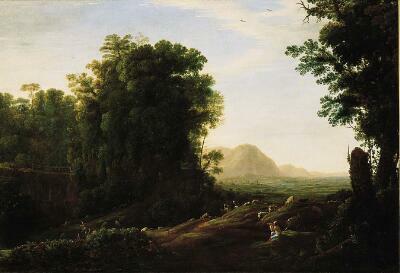 Claude Lorrain was one of the great masters of the ideal landscape. He developed a style that was neither so heroic nor so classical as Poussin's, but capable of expressing both a more poetic mood and a livelier sense of the variety and beauty of nature. The keynote of this style is the treatment of atmosphere and light. Here, the cool light of early morning is represented with great subtlety. The light in Claude's paintings usually emanates from the area of the sky just above the horizon so that we seem to look directly into it; spreading forward and outward through the composition, it permeates the whole landscape with its radiance and links foreground and background in a continuous spatial unity. The result is the idyllic, pastoral mood that so aptly characterizes Claude's landscapes. Earl of Midleton, Peper Harow, London. Early morning sunlight softly filters through the trees and creates a mood of cool tranquility. Past a large tree with luxuriant foliage on the right, our gaze is drawn into the distance. Below, a piping shepherd guards his flock, his red stockings, blue pants and yellow shirt beautifully rendered against the rocky ground. On the left, set further back in space and silhouetted against the pale sky, are leafy trees, rocks and a small footbridge. Beyond, fertile plains blend into mountains blurred by the hazy atmosphere. Landscape with a Piping Shepherd, painted about 1630, is one of the earliest known works by the French painter Claude Lorrain. Claude was one of the great masters of ideal landscape, an art that presented nature as more beautiful and harmonious than nature itself. The arrangement of forms in receding planes, with alternating bands of light and shade, recalls the art of the Venetian painters Giorgione and Titian. But Claude’s subtle, poetic rendering of light was uniquely his own. It emanates from the sky just above the horizon, and streams toward us in radiant waves. Regarded as the “prince of landscape painters,” Claude exerted his influence until well into the 19th century. Uneducated and of humble origins, he pursued his artistic ambitions in Italy, working first as a servant, and then as an assistant to a noted Roman landscape painter. The Roman campagna, a countryside haunted with remains and associations of antiquity, was among his greatest sources of inspiration.